“I took command of the troops employed on this occasion, on the 18th. They amounted to four hundred infantry, composed of detachments of the Virginia and Maryland divisions, and one troop of dismounted dragoons. The troops moved from the vicinity of the New Bridge about four o’clock in the afternoon—patrols of horse being detached to watch the communication with the North River, and parties of infantry stationed at the different avenues leading to Powle’s Hook. My anxiety to render the march as easy as possible, induced me to pursue the Bergen road lower than intended. After filing into the mountains, the timidity or treachery of the principal guide prolonged a short march into a march of three hours; by this means the troops were exceedingly harassed; and, being obliged to pass through deep, mountainous woods to regain our route, some parties of the rear were unfortunately separated. This affected me most sensibly, as it not only diminished the number of the men destined for the assault, but deprived me of the aid of several officers of distinguished merit. “Immediately on the commencement of the retreat, I sent forward Captain Forsyth to Prior’s Mill to collect such men from the different columns as were most fit for action, and to take post on the heights of Bergen to cover the retreat. On my reaching this place, I was informed by Cornet Neill (who had been posted there during the night for the purpose of laying the bridge and communicating with the boats) that my messenger directed to him previous to the attack, had not arrived, nor had he heard from Captain Peyton, who had charge of the boats. “Struck with apprehension that I should be disappointed in the route of retreat, I rode forward to the front under Major Clarke, whom I found very near the point of embarkation, and no boats to receive them. In this very critical situation, I lost no time in my decision, but ordered the troops to regain Bergen road, and move on to the New Bridge. At the same time, I communicated my disappointment to Lord Stirling by express, then returned to Prior’s Bridge to the rear guard. “Oppressed by every possible misfortune, at the head of troops worn down by a rapid march of thirty miles, through mountains, swamps, and deep morasses, without the least refreshment during the whole march, ammunition destroyed, encumbered with prisoners, and a retreat of fourteen miles to make good, on a route admissible of interception at several points by a march of two, three, or four miles, one body moving in our rear, and another (from the intelligence I had received from the captured officers) in all probability well advanced on our right, a retreat naturally impossible to our left, under all these distressing circumstances, my sole dependence was in the persevering gallantry of the officers, and obstinate courage of the troops. In this I was fully satisfied by the shouts of the soldiery, who gave every proof of unimpaired vigor at the moment the enemy’s approach was announced. 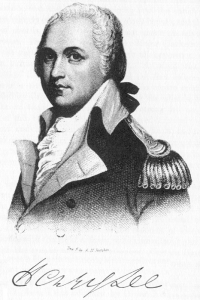 “Having gained the point of interception opposite Weehock, (Weehawken,) Captain Handy was directed to move with his division on the mountain road, in order to facilitate the retreat. Captain Catlett, of the second Virginia regiment, fortunately joined me at this moment at the head of fifty men with good ammunition. I immediately halted this officer, and having detached two parties, the one on the Bergen road in the rear of Major Clarke, the other on the banks of the North River, I moved with the party under command of the captain on the centre route. By these precautions a sudden approach of the enemy was fully prevented. I am very much indebted to this officer and the gentlemen under him, for their alacrity and vigilance on this occasion. “On the rear’s approach to the Fort Lee road, we met a detachment under the command of Colonel Ball, which Lord =Stirling had pushed forward, on the first notice of our situation, to support the retreat. The colonel moved on and occupied a position which effectually covered us. “Some little time after this, a body of the enemy made their appearance, issuing out of the woods on our right, and moving through the fields directly to the road. They immediately commenced a fire upon our rear. Lieutenant Reed was ordered to face them, while Lieutenant Rudolph threw himself with a party into a stone house which commanded the road. These two officers were directed mutually to support each other, and give time for the troops to pass the English Neighborhood Creek, at the liberty pole. On the enemy’s observing this disposition, they immediately retired by the same route they had approached, and gained the woods. The precipitation with which they retired prevented the possibility of Colonel Ball’s falling in with them, and saved the whole. “The body which moved in our rear, having excessively fatigued themselves by the rapidity of their march, thought prudent to halt before they came in contact with us. “Thus was every attempt to cut off our rear completely baffled. The troops arrived safely at the New Bridge with all the prisoners, about one o’clock P. m., on the nineteenth. I should commit the highest injustice, was I not to assure your excellency that my endeavors were fully seconded by every officer in his station; nor can any discrimination justly be made, but what arose from opportunity. The troops vied with each other in patience under their many sufferings, and conducted themselves in every vicissitude of fortune with a resolution which reflects the highest honor on them. During the whole action, not a single musket was fired on our side; the bayonet was our sole dependence. “Having gained the fort, such was the order of the troops, and attention of the” officers, that the soldiers were prevented from plundering, although in the midst of every sort. American humanity has been again signally manifested. Self-preservation strongly dictated, on the retreat, the putting the prisoners to death, and British cruelty fully justified it; notwithstanding which, not a man was wantonly hurt. “During the progress of the troops in the works, from the different reports of my officers I conclude not more than fifty of the enemy were killed, and a few wounded. Among the killed is one officer, supposed (from his description) to be a captain in Colonel Buskirk’s regiment. Our loss on this occasion is very trifling. I have not yet had a report from the detachment of Virginians; but, as I conclude their loss to be proportionate to the loss of the other troops, I can venture to pronounce that the loss of the whole in killed, wounded, and missing, will not exceed twenty. As soon as the report comes to hand, I will transmit to head-quarters an accurate return. I herewith enclose a return of the prisoners taken from the enemy. “At every point of the enterprise I stood highly indebted to Major Clarke for his zeal, activity, and example. Captains Handy and Forsyth have claim to my particular thanks for the support I experienced from them on every occasion. The Captains Reed, M’Clane, Smith, Crump, and Wilmot, behaved with the greatest zeal and intrepidity. I must acknowledge myself very much indebted to Major Burnet and Captain Peyton, of the dragoons, for their counsel and indefatigability in the previous preparations for the attack. The premature withdrawal of the boats was owing to the non-arrival of my despatches; and though a most mortifying circumstance, can be called nothing more than unfortunate. Lieutenant Vanderville, who was to have commanded one of the forlorns, but was thrown out by the alteration of the disposition of the battle, conducted himself perfectly soldier-like. The whole of the officers behaved with the greatest propriety; and, as I said before, no discrimination can justly be made, but what arose from opportunity. “The Lieutenants M’Callister, Armstrong, Reed, and Rudolph, distinguished themselves remarkably. Too much praise cannot be given to those gentlemen for their prowess and example. Captain Bradford, of the train, who volunteered it with me for the purpose of taking direction of the artillery, deserves my warmest thanks for his zeal and activity. I am personally indebted to Captain Rudolph, and Dr. Irvine of the dragoons, who attended me during the expedition, for their many services. “I beg leave to present your excellency with the flag of the fort by the hands of Mr. M’Callister, the gentleman into whose possession it fell. “Among the many unfortunate circumstances which crossed our wishes, none was more so than the accidental absence of Colonel Buskirk, and the greatest part of his regiment. They had set out on an expedition up the North River the very night of the attack. A company of vigilant Hessians had taken their place in the fort, which rendered the secrecy of approach more precarious, and, at the same time, diminished the object of the enterprise by a reduction of the number of the garrison. Major Sutherland fortunately saved himself by a soldier’s counterfeiting his person. This imposition was not discovered until too late. “I intended to have burnt the barracks; but on finding a number of sick soldiers and women with young children in them, humanity forbade the execution of my intention. The key of the magazine could not be found, nor could it be broken open in the little time we had to spare, many attempts having been made to that purpose by the Lieutenants M’Callister and Reed. It was completely impracticable to bring off any pieces of artillery. I consulted Captain Bradford on the point, who confirms me in my opinion. The circumstance of spiking them being trivial, it was omitted altogether. 1 Extract of a letter from an officer at Paramus, August 21, in the New Hampshire Gazette, September 7. 2 Pennsylvania Packet, September 2.